Whether you are a complete beginner or a professional jeweller or silversmith looking to diversify your skills, the ‘Hand Engraving: Basic Principles’ courses are an in-depth introduction to the techniques and tools of hand engraving on metal. Taught by professional engraver Wayne Parrott and engraver and silversmith Angus McFadyen, the class size is kept to just eight students and run either as a six-week evening class or a three-day intensive course. Generous discounts are available to members. It’s quick and easy to join, with memberships starting from £30 per year. If you are interested please book early, as places are limited and usually sell out. The aims will be to develop a sound basic understanding of the tools, techniques and materials used in hand engraving, on which to progressively build skills and knowledge. The setting up, sharpening and polishing of appropriate tools. Marking out and transferring techniques. The cutting of metal, with exploration of combined techniques. Production of samples from a supplied master. Applications of engraving as a decorative element in jewellery making. Wayne is a highly respected and experienced engraver and teacher. He also runs his own workshop covering a wide range of skills within the subject, including calligraphy, heraldry and his specialist interest: hand cut seals. Wayne is one of just three engravers to have won the prestigious Hand Engravers Association Lifetime Achievement Award for his services to engraving and passing on skills. Angus is a professional silversmith and engraver with over 25 years of experience producing tableware and working to commission. The majority of Angus’ work is surface decorated with low relief pictorial engraving, often with gold or silver inlays. In recent years Angus has specialised in clock and watch engraving. 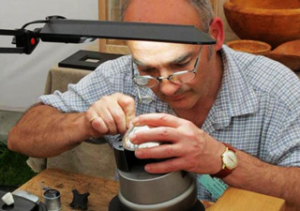 Angus is an experienced workshop leader, having taught at the Goldsmiths’ Centre and for the Creative Dimension Trust. Courses are usually in London. The courses are aimed at all skill levels, from complete beginners, to improvers, to experienced jewellers and silversmiths. This course is now fully booked. If you would like to be added to the reserve list please email info@handengravers.org.uk. We will be running further courses later in the year. Please sign up for our newsletter to keep informed of upcoming courses and events.